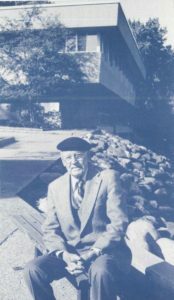 William (Bill) Kaeser (1906-1995) was the architect for Hasler Laboratory of Limnology. Mr. Kaeser’s initial 1984 contribution would be the nucleus for an endowment that would finance a lectureship in his honor. A Kaeser Brochure paying tribute to Mr. Kaeser aided in gathering support through contributions and bequests from interested alumni and friends including corporations and foundations. The sole purpose of the fund would be to aid the CFL in its teaching, research and public service roles with the full legal name of the William V. Kaeser Visiting Scholar Fund. CFL graduate students and post docs select, invite and schedule Kaeser scholars; allowing for a wide range of scientific interests to share in the decision making process. See below for list of past Kaeser Scholars.